Last night at my late night workout it was time to test out the new original workout. I know I told you before but I am trying to make a few new workouts for a friend but I wont give them to her until I try them out. Well, last night was a boxing workout! And it was a doozie. It was a three circuit workout and each circuit was repeated at least twice and maybe 3 times. I have been dying to get more into boxing, I used to do Tae-Bo and loved the way my arms looked so I have just been wanting to get back into it. It had punches, push ups, crunches, jump rope and fun little sprints. 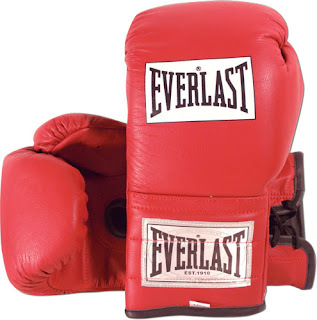 I realized that I need a set of punching mitts but dont worry they are on the way. I really liked this workout and cant wait to do this one again. Success....I think so! After working out I went to do some house work, paint and stuff. Well today my arms are sore and I cant tell if its from punching or from holding my arms up over my head for hours on end. Either way they are sore. Then today I got to sleep in a bit, the first time in over 2 weeks, ahhhhhhh so nice. Then I woke up and put on my workout clothes and went to Zumba. I am still in my workout clothes (at work) and enjoying an extremely casual day. I will be swimming tonight with my swimming partner tonight and then a one mile swim all by my lonesome. I am trying to get in ever last workout I can. Fun stuff.